Stadion Oosterpark was the home of FC Groningen until the club moved to Stadion Euroborg in 2006. First sports was played at the site of Stadion Oosterpark in 1933, however the site back then only consisted of one football pitch and three pitches for field hockey. The football pitch did not have any stands, nor its own changing facilities. This changed in 1935 when a modest stand with about 500 seats was built. A few years later earth banks were laid around the pitch so that more people could witness the games. Just after the Second World War the stadium was in urgent need of expansion as often as much as 4,000 people attended the matches, however insufficient materials were available due to the general scarceness of goods. After this had resolved in 1948 the stadium got quickly expanded with three concrete terraces, which lifted the capacity to 15,000 places. A few years later a new covered seating stand was constructed. In the 1950s various clubs from the city of Groningen made use of the stadium, most notably the Oosterparkers and GVAV, and with the successes of the latter more money became available to improve the stadium and increase capacity. The stadium got its current shape in the 1960s with the construction of two covered seating stands behind each goal, which brought capacity to about 18,000. After in 1971 FC Groningen got formed out of a merger of various clubs from the city, the club became the regular occupant of the Oosterpark. Few changes were made until in the mid 1980s a new south stand was built. By the end of the 1980s the official capacity was 22,000, however this was never met due to security requirements. The official record attendance was therefore set at 19,500, achieved during a UEFA Cup match against Swiss side Servette in 1988. Last changes to the stadium were made in the late 1980s when a new main stand was built. Still the old stadium hardly met basic requirements and when in the 1990s many Dutch clubs started building new stadiums the club felt the need to move too. Plans were therefore made for a new stadium in the south of the city. As the club did not feel like investing much in the old stadium, the standing sections were closed instead of converted into seats (which was a requirement of the Dutch FA). Wooden puppets were put in the standing sections to make the stadium look less empty. However, when the club got promoted again to the Dutch Eredivisie in 2001 (the club had relegated two years earlier) and the realisation of the new stadium suffered various delays, seats were installed anyway, which brought capacity down to 12,500 seats. 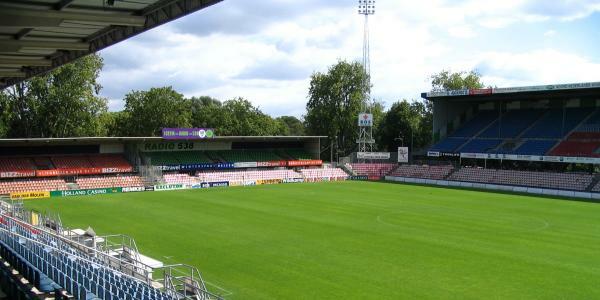 FC Groningen played its last match at the Oosterpark on the 22nd of December 2005. The cup match against Volendam ended in a 3-0 win for the home side. One month later the club moved into the new Stadion Euroborg. The Oosterpark was subsequently demolished and replaced by housing.